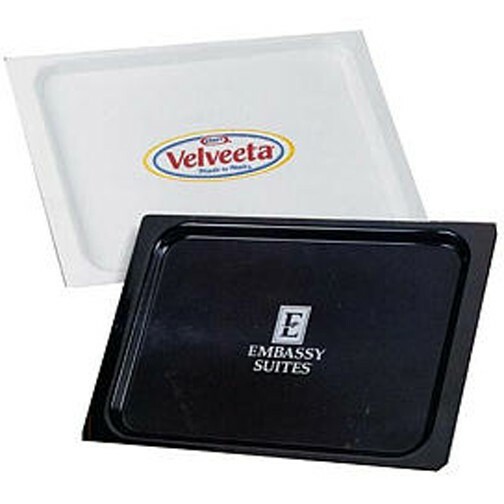 RUGGED POLYSTYRENE AMENITIES AND SERVING TRAYS! 10 ½”h x 14 ½”w Serving Tray made in USA of food grade Polystyrene Plastic. BPA free and highly visible for product displays, hospitals, hotels, branding and packaging. IMPRINT: One color, one location imprint in a 4”h x 6”w area. See Additional Imprint Information under "Options" above for stock imprint colors and additional imprint color charges. EXACT REPEAT ORDER SET UP: $20.00 (g) per imprint color.